Thirteen novels with modern humans facing off against heroes, Norse and Greek gods, djinn, and monsters of old … over one million words of divinely (and diabolically) inspired fantasy, adventure, and romance. Join the freshest voices in urban fantasy and paranormal, New York Times, USA Today, and Amazon bestselling authors, on unique journeys to heaven, hell, and worlds beyond. 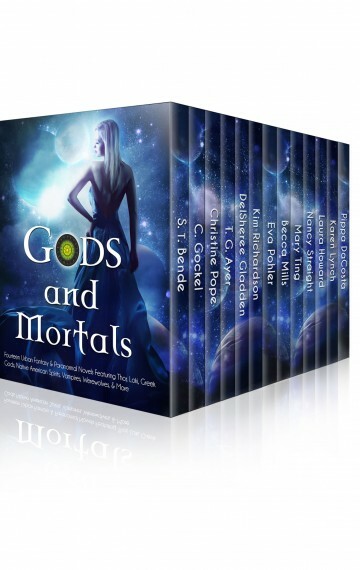 Get this heavenly collection of paranormal romance and urban fantasy … before it’s too late! Kristia Tostenson just found out her new boyfriend is the Norse God of Winter, and an immortal assassin destined to die at Ragnarok. Her orderly life just got very messy. Amy Lewis is being pursued by a very bad wolf. Can Loki God of Chaos and Mischief save her, or even save himself? When a fatal fever nearly wipes out the entire world’s population, the survivors of what became known as “the Dying” believe the worst is in the past. Little do they know…. Bryn Halbrook, modern teenager, creature of myth. Dead Radiance makes Norse Myth a contemporary truth, pitting one teenager girl against Trickster gods, and mythical creatures. A young woman from small-town Wisconsin discovers that monsters are real — and that she might just be one herself. Protecting Claudia from the fallen was half-angel Michael’s his duty. Falling in love was never part of the plan. Uriah and Claire didn’t believe in their tribal stories until Claire’s poisoned and those myths spring to life to test their love and unravel destiny. father’s identity until her mother’s death. She discovers a family she never dreamed of and a world that should not exist. Can the magical Tuatha de Danaan, the forgotten people of Ireland, help Allison restore her mother’s sanity? herself in Horizon as a rookie in the Guardian Angel Legion. Sara Grey lives a double life until a fateful encounter with a sadistic vampire and a fearless warrior exposes her powerful gifts and changes the course of her life forever.